With much respect given to what farms are to us, director and producer Richard Power Hoffmann is proud to bring the premiere of his film Watermelon Magic to the Liberty Science Center in Jersey City, N.J. this week. The Hoffmann Family resides in Media, Delaware County and is known to frequent Wolff’s Apple House for corn, apples, Pequea Valley Farm yogurt and sometimes even watermelons. In the 30-minute film released through Spring Garden Pictures, his daughter, Sylvia Green Hoffmann, stars as the brilliantly charming Sylvie who finds her way around the family farm with her magic wand in hand. After tossing her wand too far during a moment she can’t erase, Sylvie sees a wheel of her father’s tractor crush it into pieces. She soon runs to her mother for comfort with her loss. Sylvie’s mother, played by her actual mother, Holly Hoffmann, helps to cheer her up, with the two working side by side to plant watermelon seeds in their family’s greenhouse. In the film, Sylvie’s father is played by Chris McNichol who served as the co-farmer of Red Hill Farm in Aston, Delaware County with his wife Amy a few years ago. The two ran a community-supported agriculture (CSA) program there and were a part of Richard’s début agricultural film, Fridays at the Farm, which is set in a personal essay style and narrated by Richard. Watermelon Magic follows Sylvie’s adventures around raising watermelon seedlings, transplanting them into a field, installing a drip-line, keeping her little brother from tromping on the young plants when his baseball lands among their leaves, building a bamboo fence all by herself to protect them and learning to part with the green-skinned beauties when they’re ready to sell at the market. What’s most captivating about witnessing Sylvie’s experience is the feel of how the scenes are portrayed, in that Richard pieced together the film in what he describes as assembled still images in high resolution and time-lapse, shutter-burst and freeze frame techniques. Only a short glimmer or two throughout the half-hour are done in traditional video filming. Watching the watermelon plant leaves wiggle and grow to life, expanding upward toward sunlight, easily keeps the audience in awe of nature’s miraculous daily living in the soil we cultivate. The watermelons balloon and gather their stripes into plump shapes; happily hypnotized, Sylvie loves her garden. Richard explains that 80 percent of the film’s imagery came from footage taken at Hillside Farm at Elwyn in Media, while 20 percent of it stemmed from the Longview Center for Agriculture in Collegeville, Montgomery County—both of these farm operations are run by the community-geared Greener Partners. He notes the impressive 90-day life cycle of a watermelon, from seed to richly pink chomping material behind the rind. And he says crafting a story around this process helped the film to steer clear of becoming lumped in with less captivating documentaries that also show how plants grow. While Sylvie first believes the magic is in her wand, she begins to understand that what is magical is in fact in nature and its ties to creating our food in the ground. And by the end of the film, her broken wand is repaired but with a small tree branch holding the plastic glittery gem parts; a wire-made heart now stems from one end, too. Sylvia says she enjoyed putting up the fence and painting the garden gate sign to read “Sylvie’s Garden,” in her time being a part of the film. And when the 40 watermelons were ready to go, she wanted to eat them. Richard adds that he hopes those who see the film will feel compelled to become stewards of the earth. The premiere of Watermelon Magic at the Liberty Science Center begins at 10.45 a.m. on Thursday, January 16. The schedule for Friday, January 17 is 10.45 a.m., 12.15 p.m. and 1.45 p.m. Additional 3.15 p.m. and 4.45 p.m. showings will play on weekends. 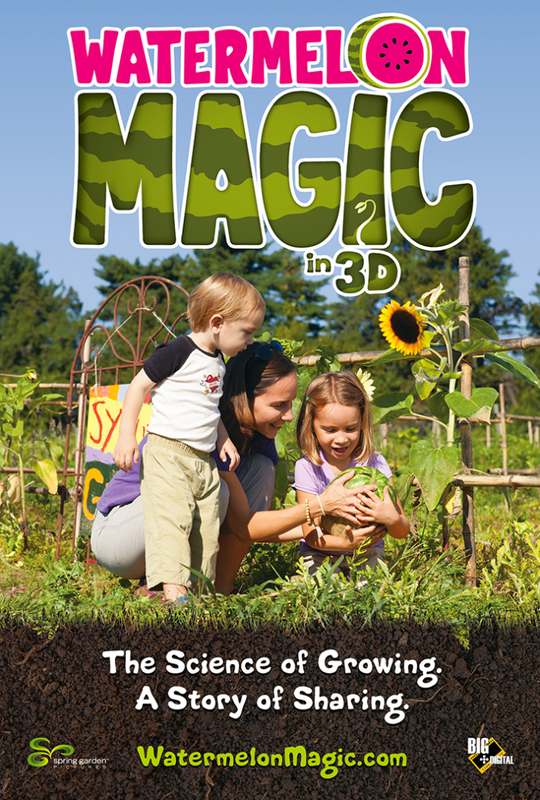 Watermelon Magic is also in the works to be screened at the Franklin Institute in Philadelphia this spring. The Liberty Science Center is located at 222 Jersey City Boulevard in Jersey City, NJ 07305. “Watermelon Magic” Trailer from Spring Garden Pictures on Vimeo.